Over 70 years old, this is an original, unrestored Packard…original finish, original upholstery…original engine and power train. Documented mileage; 34,000. 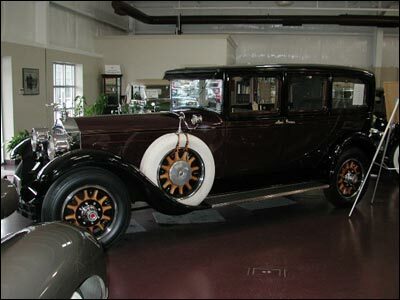 This car was the featured 1928 model Packard at the “Opus Magnum,” the premier showing during the 100th anniversary celebration of the Packard Motor Company in Warren, Ohio, July 4 through July 9, 1999. Over 800 Packards, as well as Packard collectors from the world over, were there for this once a century event. This great Packard 443 is an outstanding example of the fine car craftsmanship, engineering and attention to detail that was the trademark of luxury automobiles of earlier times. It is still sound and dependable and will cruise elegantly and comfortably at 45 to 55 miles per hour. The ‘Golden Age’ of the Packard automobile occurred during the decades of the 1920’s and 1930’s. Preserved and restored Packards of this era are the true classics of today.